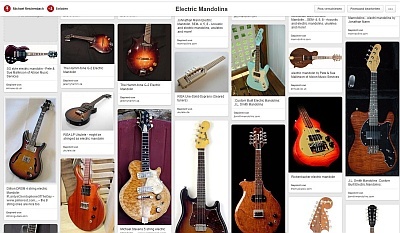 In my link collection about electric mandolins you can always find the best and latest links about electric mandolins! Please share this page if you like it! 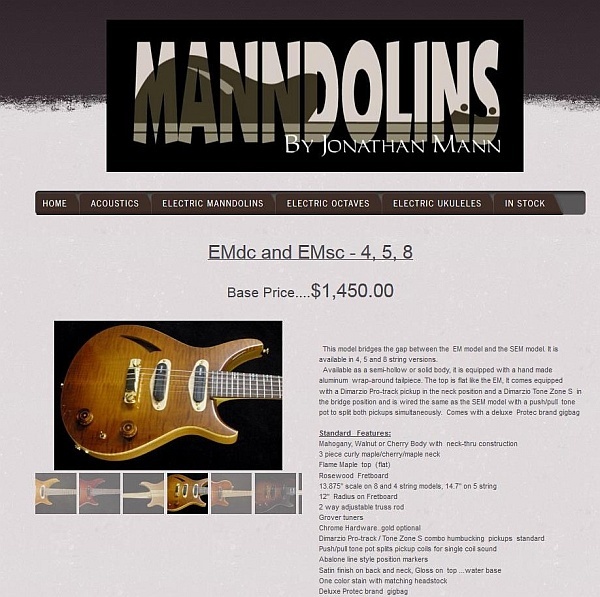 Jonathan Mann is building 4-, 5- and 8-sting electric mandolins, octave mandolines and ukuleles. He is using his neck-through methd for the construction. 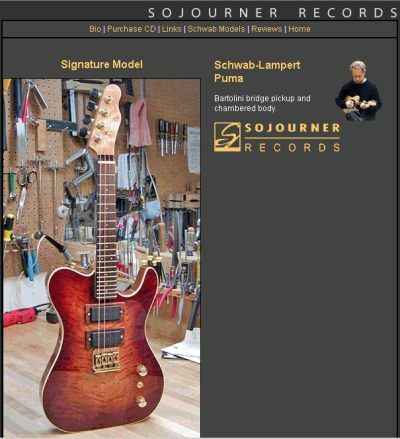 Jonathan Mann is building many different models, including solid-body, semi-hollow and hollow body models. 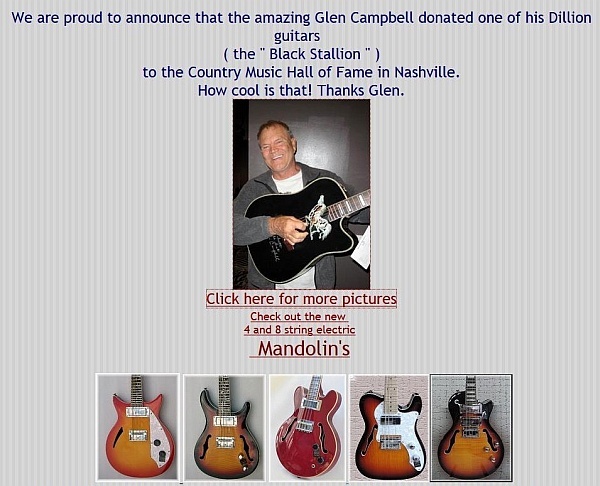 On his website you cand find many pictures of his electric mandolins. Kevin Schwab builds 4- and 5-string electric mandolins since the 1980s. Michel Lampert plays four- and fivestring electric mandolins made by Kevin Schwab. He plays Jazz, the sound of the electric mandolin reminds to the clean and round sound of electric jazz guitar. You can download some examples of his sound from his homepage. 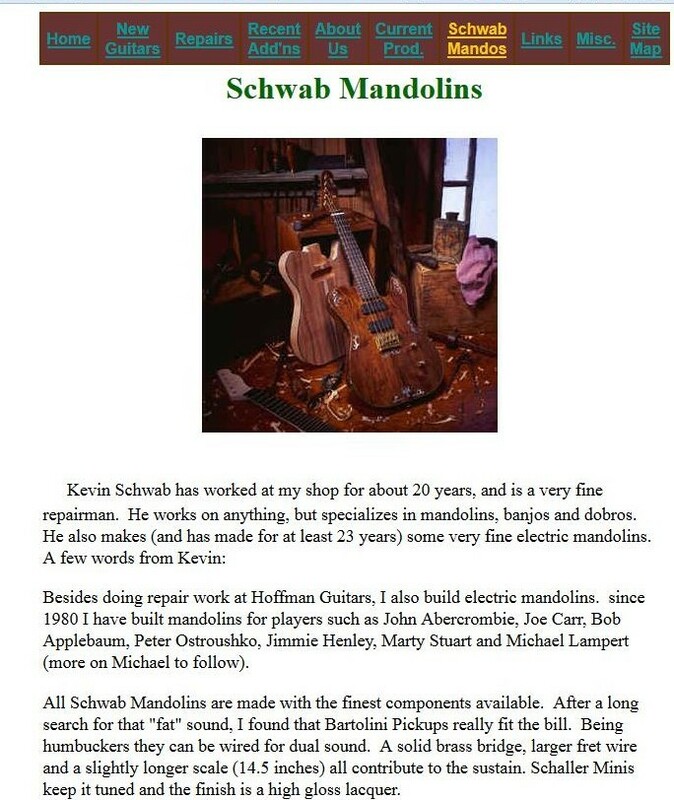 More picturs of Schwab mandolins can be found on a special mandolin page of the Hoffmann Guitars homepage. 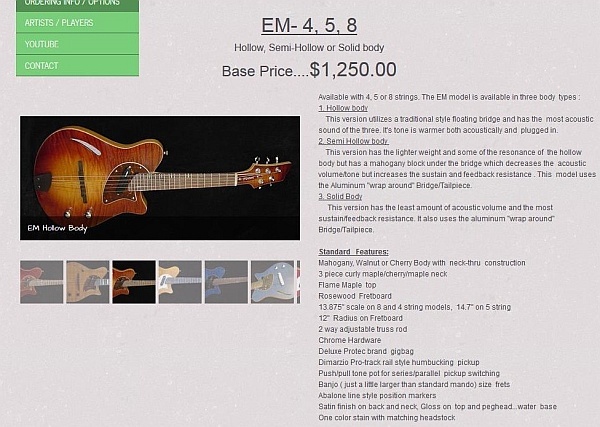 The band Feral Conservatives uses electric mandolins, and I found a model which I did not know. The mandolin player told me that this is a new mandolin by dillionguitars USA. ich eine elektrische Mandoline die ich nicht erkannte. Ich habe nachgefragt und erhielt die Auskunft dass es sich um ein Instrument von Dillion USA handelt. 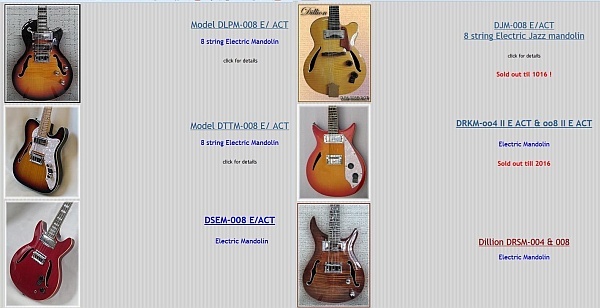 Dillionguitars are offering several nice mandolin models with 4 or 8 strings. 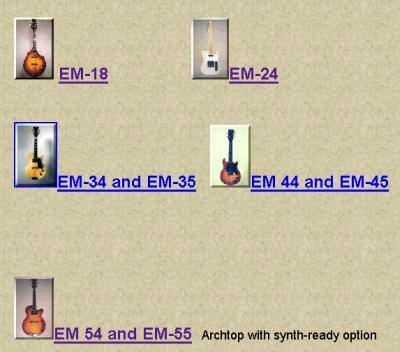 Steve Ryder offers several electric mandolin models, including an octave mandolin (mandola). He is also producing handmade pickups for mandolin. 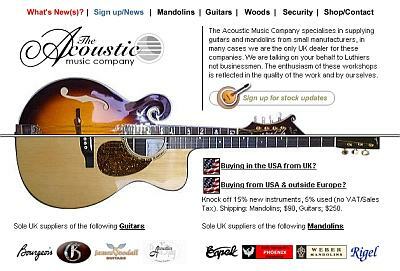 The Acoustic Music Company - a shop located in Brighton, UK offers a big selection of mandolins and guitar. 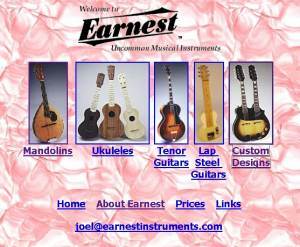 Here you can find new and vintage mandolins and guitars and also electric mandolins branded TAMCO, designed by this shop. The Amsterdams Gitaar- en Mandoline - Duo Marijke and Michiel Wiesenekker - have recorded several CDs with the music they like - Blues, Folk, Songs, Bluegrass, Klassik. 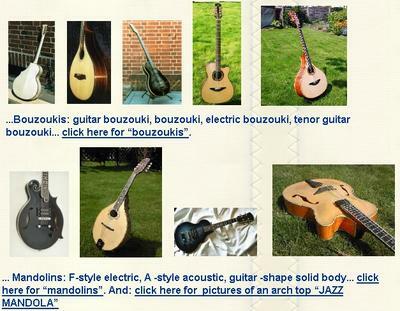 Marijke owns an electric Rickenbacker mandolin which is shown oh their homepage. German luthier Andreas K�pke has built all kind of instruments, some of them electric like the electric F-5 or the very interesting archtop jazz mandola. He has also built a cigar box ukulele. Great website with many beautiful pictures! Joel Eckhaus has been building instruments since 1973. 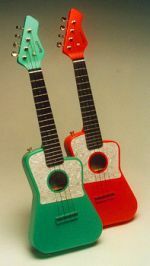 A ukulele named "Sputnik" in red or green is his newest creation. 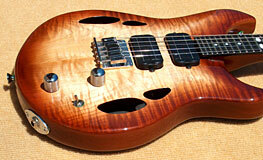 He is also building several models of electric mandolins, the Swamp Cat has been designed with Barry Mitterhoff. Joel Eckhaus is building instruments since 1973. The newest model is a ukulele in bright colors name Sputnik. 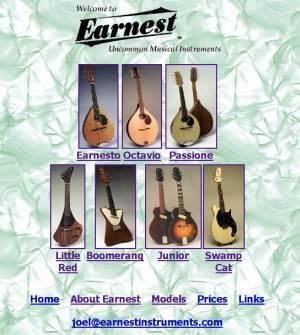 Blues Fran�ais - also with electric mandolins! Jean-Louis Mahjun and Alain Giroux are playing Blues with electric violin and electric mandolin. You can download some examples. The two players are Jean-Louis Mahjun and Alain Giroux. You can find music and videos with electric, amplified mandolin and violin. Ron Oats was building electric mandolins in Boulder, Colorado. I like his design of Rono mandolins! Sandy Sanderson is a patient man. I’m not just saying that because he has to teach woodwork and metalwork to secondary school kids. I say that because he has no problems waiting four whole years for wood to dry. It’s no ordinary wood mind; this is 2,500-year-old swamp kauri, from which Sandy shapes and carves unique electric instruments. Electric mandolins made in New Zealand by Sandy Sanderson, bodies made from Swamp-Kauri, and necks stabilized by carbonfibre. Due to a motorcycle accident Sandy Sanderson cannot build or repair instruments any more. 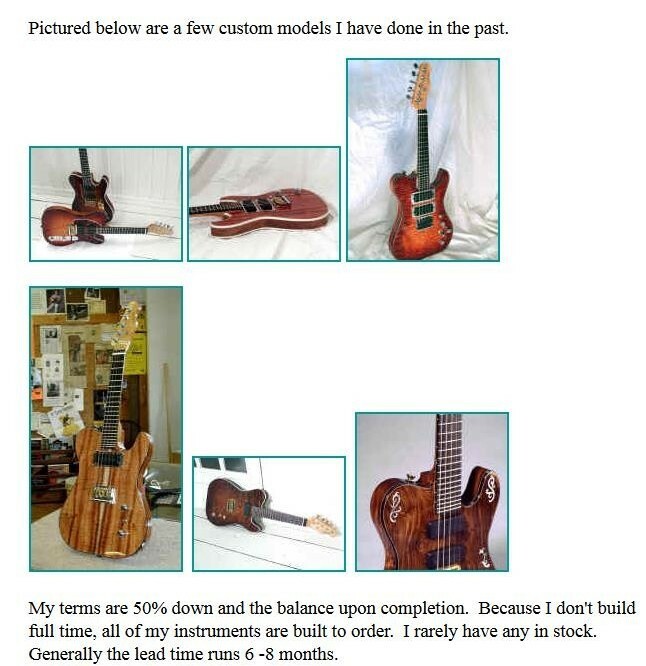 But his Homepage does contain some interesting pictures of electric mandolins and guitars and information about swamp kauri wood used for the bodies of his instruments.